Hilton HHonors has launched a fourth night free + $100 resort credit Summer Sale for stays at participating hotels in the Caribbean. The offer is valid for stays until September 30, 2015, that are booked by September 26. 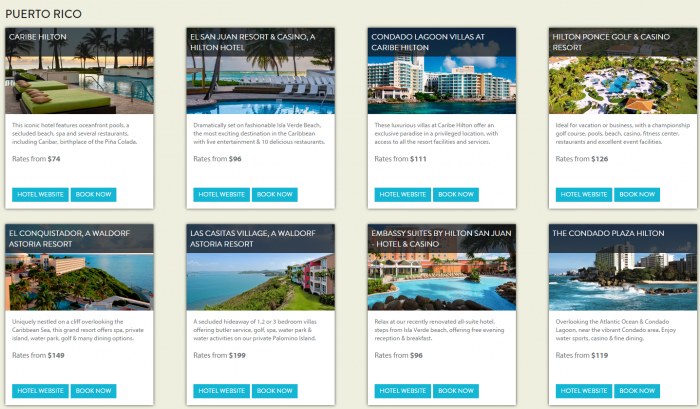 Hilton has extensive number of properties especially in Puerto Rico and quite a few on the other Caribbean islands as well. If you visiting the Caribbean before the end of September, you should check the rates offered under this promotion. Offer is subject to availability at participating hotels & resorts within the Hilton Portfolio in the Caribbean, offer details stated herein, and the selected hotel’s booking terms and conditions. Book between May 29 and September 26, 2015 for stays between May 29 and September 30, 2015. Offer requires advance reservations and a minimum stay of four (4) consecutive nights. Each hotel has a policy addressing cancellations and/or blackout dates that may apply. Blackout dates, early departure fees, and deposit and cancellation restrictions may apply and vary by hotel. Rates will vary based on individual hotels and specific travel dates selected. Unless otherwise stated, quoted rates are per room per night, based on single/double occupancy and do not include taxes, gratuities, incidental charges and resort fees (if applicable). Participating hotels are subject to change without notice. This offer is not applicable to existing reservations or group bookings, and may not be combined with other select promotions, discounts or offers. To reserve this package by phone, please contact us at 1-800-HILTONS if in the USA/Canada, or view a complete list of Hilton Worldwide local reservation offices. When booking, you must book the “Stay and Play Longer” package (Plan Code “RPPSL1” or “P7L”) to receive all package benefits. Complimentary fourth night is non-transferable and must be consumed during same stay in which it was earned. Complimentary night includes room rate, tax in same category room as paid night(s) and does not include gratuities, resort fees or incidental charges. Offer requires a minimum stay of four (4) consecutive nights. Complimentary fourth night is earned after three (3) paid nights. The value of fourth night stay will be applied as a discount to the daily rate paid for all consumed nights as a discount of 25% off nightly rate, which relates to the hotel’s Best Available Rate,(“BAR”), which is a specific rate type that varies depending on time of purchase, is unrestricted, non-qualified and excludes discount or negotiated rates. Early departures will forfeit free night(s) and rate discount not earned on nights consumed. After initial four (4)-night stay requirement, a daily rate discount may be applied to additional nights consumed. For each completed stay period of at least four (4) consecutive nights, a $100USD hotel credit will be awarded at participating properties. Credit will be applied to guest folio at time of checkout. For properties which operate in a local currency, the prevailing exchange rate equivalent to $100 USD in hotel’s local currency (as determined by the property) will be applied to the folio in the value of credit earned. Credit may be applied towards certain hotel charges excluding room rate, corresponding taxes and select activities as determined by the property. Hotel credit is non-transferable, void upon checkout, and cannot be redeemed for cash or applied towards future stays. Limit one (1) hotel credit per room per stay. Unless otherwise noted, all offer components are non-transferrable or redeemable for cash, expire at check-out and may not be used or applied on future stays. This offer may not be combined with other select promotions, offer or discounts and is not valid for existing reservations or groups.